Is there any particular job on the Kappa platform that you've felt the need to have flex sockets or pass through sockets? I ordered a Metric/SAE combo set of Gearwrench flex sockets from TOOLSid they didnt send me the SAE set. They claimed that the combo set promotion was no longer going on and I wouldn't be getting a SAE set. They told me if I wanted to return the Metric set that I would have to pay my own shipping to return it, and I wouldn't get my original shipping ($17) back. It only took a couple emails from me offering to file a dispute with my CC company claiming false advertisement from TOOLSid before they offered to give me a full refund plus pay shipping back. Now that the metric set is being returned I'm questioning whether or not I even need a set of flex sockets. I've never had them before and have managed to get all jobs performed successfully. If anyone can tell me a job that they just had to have the lower profile of a flex socket vs flex joint + socket then I'd be more inclined to rebuy one. How about a pass through socket set? Last edited by Sting Ya; 03-07-2019 at 10:26 AM. I have a pole barn about 150 feet from my house and "heavy wrenching" always occurs in that building. When I decided to stock a tool box in the house garage, mostly for tweaking things on the Solstice and household projects/repairs, I decided to buy a socket set with a flex head "just in case". I've used it a couple of times per year since buying it. Again, not an "essential" but it has come in handy several times. My son bought me a set of pass-through sockets 3 years ago for Christmas. Haven't used them once yet, but as Sting expresses - when I need 'em, I got 'em. I don't like to waste money any more than anyone else, but I've owned the "major usage" tools for many years now. I won't hesitate to suggest the "nice but not necessary" tools as gift ideas from my family. Sting Ya and Saveaux like this. This is hanging on my wall right now. Regardless, I have never bought a tool that I didn't at least have an expectation that I would use. If I see a tool I don't have I bring it home. I have a lot of people who use my tools as well. I have a tool set in both my trucks and my trailer. I have generally four of everything that I have collected over the years. My wife and kids buy me tools for birthdays and Christmas. three walls of my garage are home to tool boxes. 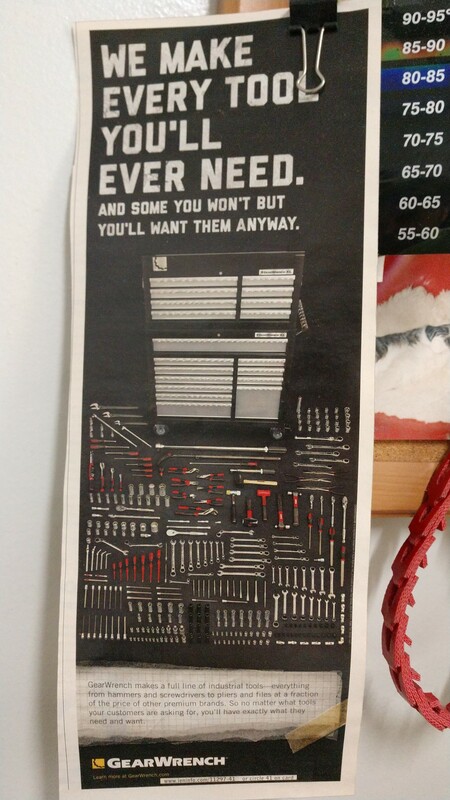 You can never have too many tools. I'm always on the lookout for tools that provide some sort of different access. Whenever I come across any wrenches, pliers, etc with some sort of offset, angle, size or flexibility that I don't currently have I will buy them if they're reasonably priced. It never fails that I find a use for them within a couple of months. Well, except in the office . . .
Sting Ya, raygun and Saveaux like this. I would always do the balance between having something done, and worrying about the level of care, or buying the tool(s) and doing it myself. Buying the tools usually won out, less often now that I'm older with less strength and flexibility. Still have the desire, knowledge and patience though. We don't want to think about it but someone is going to think they've hit the jackpot at our estate sales. Sting Ya, raygun and syjos like this. I have a complete mechanics tool set in my basement shop, garage and boat. Plus a woodworking shop, tools and materials. I purchase mostly new from Craftsmen but have many tools from garage and estate sales. After seeing wives and children selling their deceased husbands and fathers tools and toys at estate sales, I told my wife that when I hit 75 or my health starts to decline, I will place price tags on everything I own. Sting Ya, raygun and 4501 Safari like this. When y'all decide to have an estate sale, I hope you call me first. On a slightly less depressing note: I have a number of tools that I've used once, or rarely. Having the right tool will save you HOURS in some circumstances. For instance, I'd never heard of a crowfoot wrench until I had to pull the turbo off of the '06 for the third time. It saved me a ton of time. I also hadn't seen pass-trough sockets before, but that would probably have made my recent water pump adventure far more expeditious. On a slightly less depressing note: I have a number of tools that I've used once, or rarely. Having the right tool will save you HOURS in some circumstances. I totally agree. I have tools that's been used once or twice in the last 50+ years. When you need them, its handy to have your own instead of trying to find one to rent. My wife will send you a personal invitation to the estate sale. She has many on her list. All friends. I just spewed fried rice. It was not fun. Thanks for that. Not the first time; no more reading the forum while eating or drinking. Personally, I plan to live forever so my kids can’t get the car.